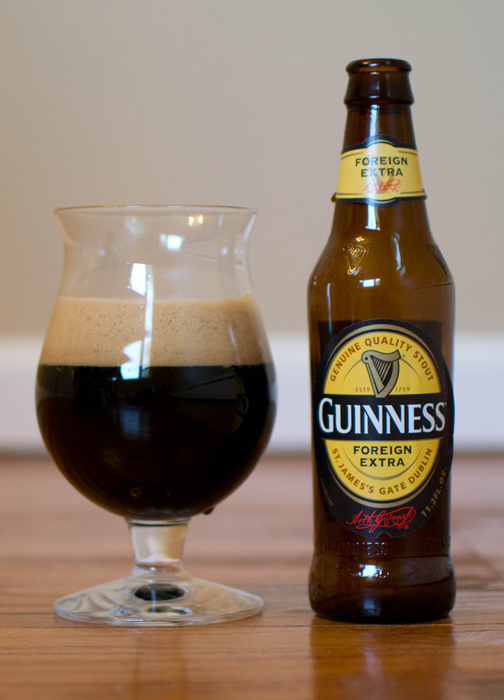 Beer #109 – Guinness Foreign Extra Stout by Guinness Ltd.
Guinness Foreign Extra Stout by Guinness Ltd. Happy St. Patrick’s Day! Even though I don’t have a lick of Irish in me, I have celebrated St. Patty’s Day my whole life. That usually involves eating corned beef and cabbage and in later years, drinking a nice beer. So to finish out my Irish beer extravaganza, I will do the same and finish it with a beer from the most recognizable Irish brewer (at least it is to me), Guinness. Beer #109 is Guinness Foreign Extra Stout by Guinness Ltd. 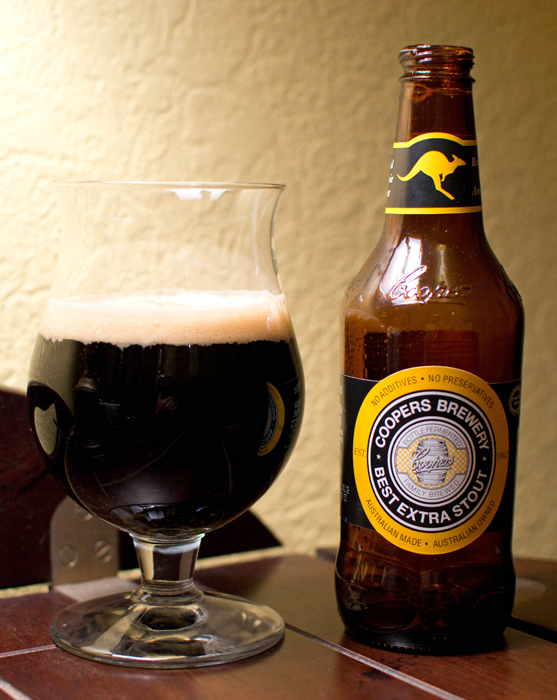 This Foreign/Export Stout is brewed in Dublin and has an ABV of 7.5%. This Irish legendary beer poured a very dark brown, probably more like black with a huge tan head. The nose was full of malts. I got dark roasted coffee, cocoa, some caramel, a bit of vanilla and something slightly sweet. It tasted just like it smelled, roasted coffee up front then some semi-sweet malty flavors finishing off with dark chocolate and a nice hop bitterness. The mouthfeel was nice and creamy, slightly heavy and very well carbonated. It was very easy for me to drink, I wish I had another or three. This is the best Guinness I have had but not the best stout I have had. Guinness Draught is what I think you typically get in bars and what most people think of when they hear Guinness. This was light years ahead of Guinness Draught, give it a try if you happen to have it available to you. I don’t think you will be disappointed. Happy St. Patty’s Day to all and Slainte! 76 beers down and not one from the state I live in. Odd? Sure is since I’m sure there are plenty of fine brews brewed in NJ. I’m not really sure why I haven’t had one from NJ yet so I figured why not start today? Beer #77 is Exit 13 by Flying Fish Brewing Company. Flying Fish is brewed in Cherry Hill, NJ. 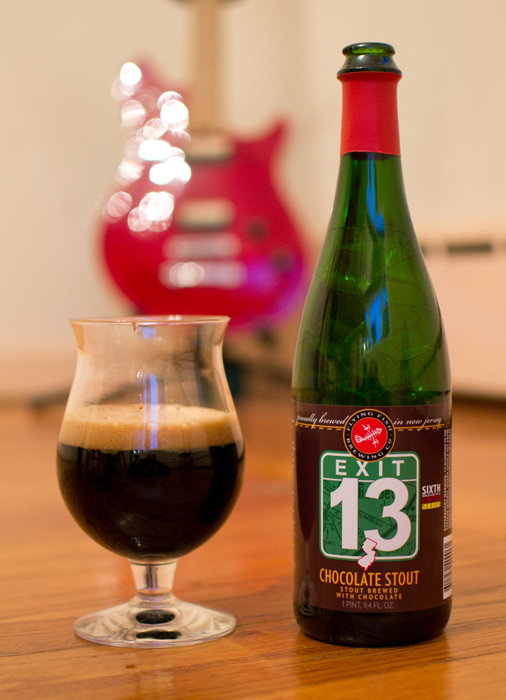 Exit 13 is a Foreign/Export Stout with an ABV of 7.5%. Chocolate is the name of the day for this brew and that sounds very good to me. Exit 13 by the way is the exit on the NJ Turnpike for Elizabeth. Elizabeth was founded in 1665 and was the first capital of NJ along with the original home of what is now Princeton University. Exit 13 poured a lovely opaque black with a tan head. I dipped my nose into the tulip glass and man oh man did I get lots of awesome smelling chocolate aromas with a nice amount of roasted malts. All those chocolate aromas had my mouth watering for a taste. And taste it I did. Chocolate flavors, kind of like cocoa and some coffee hit me first followed by a bit of hops and finishing off rather dry and a tad bit smoky. Quite a bit of carbonation was going in in this slightly heavy bodied beer. 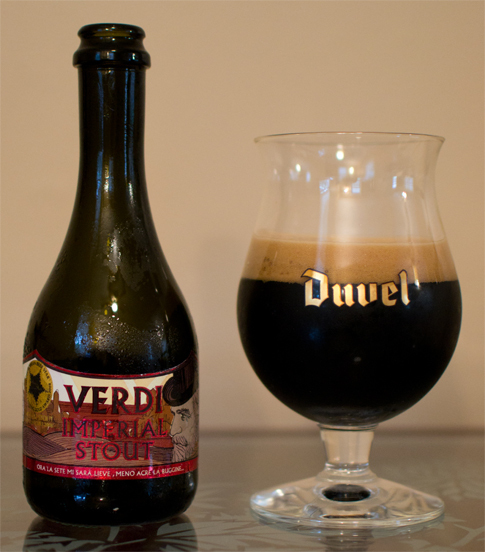 Nice and easy to drink with pleasing, for me anyways (huge chocolate fan here), flavors and the alcohol hidden really well. This was a very good way for the NJ beers to start. This was a fine stout infused with chocolate that I liked and would have no issues getting again. You better watch out, you better not pout, you better mind your p’s and q’s, be good for goodness sakes. Ah yes, be good for old St. Nick is always watching. And what if you are a naughty little boy (maybe one who coaches a NY football team and has a thing for feet) or girl? Well then in your stocking you will find a lump of coal. 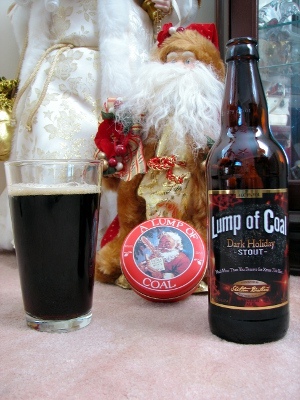 Speaking of lumps of coal, beer #25 which hails from jolly old England, is Lump of Coal by Ridgeway Brewing. Lump of Coal is a Foreign/Export Stout with an ABV of 8%. Unfortunately, this truly is a lump of coal. It looked like a stout, color was dark brown that was almost black with a tan head. I took a whiff and was puzzled by the lack of almost any aroma. I did get some very faint burnt roasted malty odors but that was about it. This kind of reminded me of the Guinness aroma that I had last week. The taste was a bit better with some coffee and a bit of chocolate. Mouthfeel was on the watery side with just a bit of carbonation. 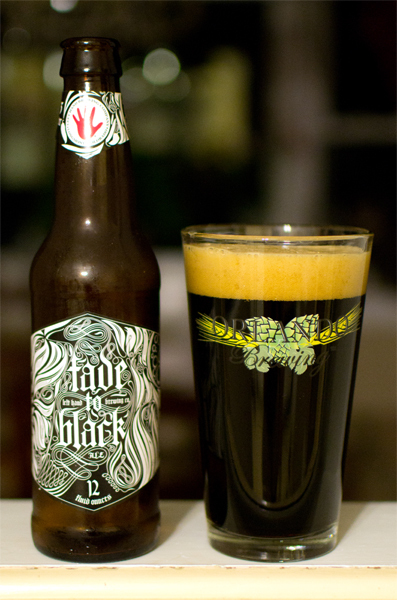 It is a really easy brew to drink even with the ABV of 8%. That ABV is hidden really well. Overall it was a pretty average stout. This was better than the Guinness I had last week but there are much better stouts out there to be had. I hope Kris Kringle doesn’t leave me any more of these in my stocking.